Most businesses that have a Facebook page have probably attempted running a contest or giveaway with the hope that it would expose their products and services to new people who otherwise might not have known about them and this would in turn generate new sales and customers. Sounds pretty straight forward doesn’t it? We tried online contests & they didn’t work! I’m sure many of you found in reality new sales never came & the exposure your business got was difficult to quantify considering the time, money & effort you put in. Don’t worry, we’ve all been there and it isn’t your fault. I’m sure you were just following the general consensus where business owners were led to believe Facebook contests (and Instagram too) were very easy to do. Just put up a prize, post it and watch the entries flood in. It’s no wonder most of them fail miserably. Even contests that can appear on the surface to be a success often turn out to be less than ideal when they fail to generate real prospects, customers or sales. The reason your Facebook contest didn’t work! Contests on Facebook are like any other promotion designed to increase sales, they need a correctly configured process to work. They require a specialised custom sales funnel. A sales funnel is the process of taking a prospective customer from discovery of your product or service, through to purchasing and beyond, with the goal of having them become a long term repeat customer. A contest is just another way to help generate new business but to do that they need to be set up correctly otherwise they rarely work. However, when set up correctly and integrated with a properly optimised sales funnel (for even better results), it can be the most powerful way to generate new business and wide scale brand recognition you will ever find! Unfortunately, very few people understand this and that’s why many contests in the end, fail to produce positive results. 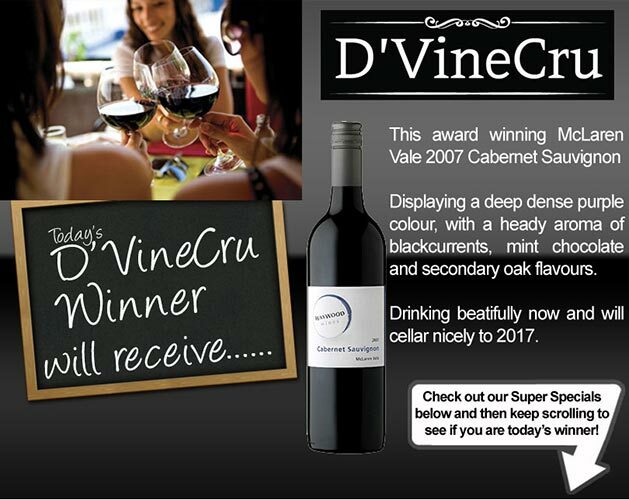 We’ve been running Facebook Contests for 6 years & have nailed them! The good news is Disruptive Cartel have developed a unique Facebook contest system that has been optimised over 6 years of testing across countless contests in dozens of different niche markets as well as being continuously tweaked to always stay current with the numerous changes to the Facebook platform. The result is a system that produces incredible results for businesses in dozens of different industries! Imagine What Finding A Totally New Source Of Customers Could Mean For Your Business? Imagine where your business would be if you were somehow able to bring in additional new customers consistently all year round, over and above anything you currently do, whilst keeping existing and past customers engaged, in touch and buying more often from you? Imagine the extra profit being injected directly into your bottom line! Plus you’d have a major advantage over your competition. Chances are they tried online contests in the past and failed and wrote them off as a bad idea long ago. So whilst they’re laughing thinking you are crazy running online contests, you’ll be gobbling up market share right from under their noses! Now that’s winning! Think about how less stressful business would be knowing in advance the approximate revenue you could expect to generate from a promotion, and knowing that you can turn it on like a tap when required. The crew at Disruptive Cartel have been involved in sales and marketing for 26 years, online marketing since 2001 and specialising in Facebook marketing & sales funnels since 2010. We’ve been responsible for building some of the highest engaging Facebook pages going around under our Just Social brand, we’ve created and developed Facebook contest apps with elite Facebook Preferred Marketing Developers like Fans2Page and have been privileged to work with, be taught and certified by the very best digital marketing experts in the world! 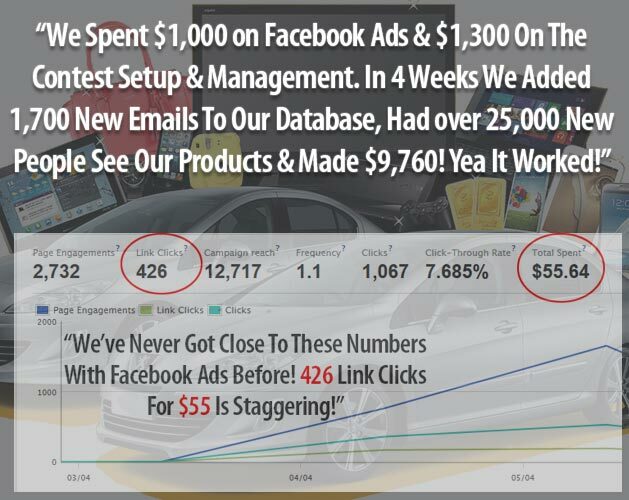 We’ve also run thousands of Facebook ads & spent hundreds of thousands of dollars doing so whilst creating & implementing dozens of incredibly successful Facebook contests for clients as well as our own businesses over the last 6 years. The result is a contest system that produces clients seriously impressive results! So rest assured when it comes to Facebook Marketing through contests with FB ads, we know where the brake and clutch is! Contests Work For Any Type of Business! Significant increase in goodwill & positivity around a business. Customers who think you’re a quality caring & generous organisation have a higher lifetime value by purchase volume and frequency plus provide more referrals. Significant increase in the real and perceived value of a business through the amplification of brand recognition that occurs in local niche markets when businesses run consistent contests and giveaways. This one post reached over 52,000 people, 3,000+ Likes, 1,350+ comments & 850 Shares! It also resulted in 4,400+ views of the image & 5,000 link clicks & other clicks on the post! 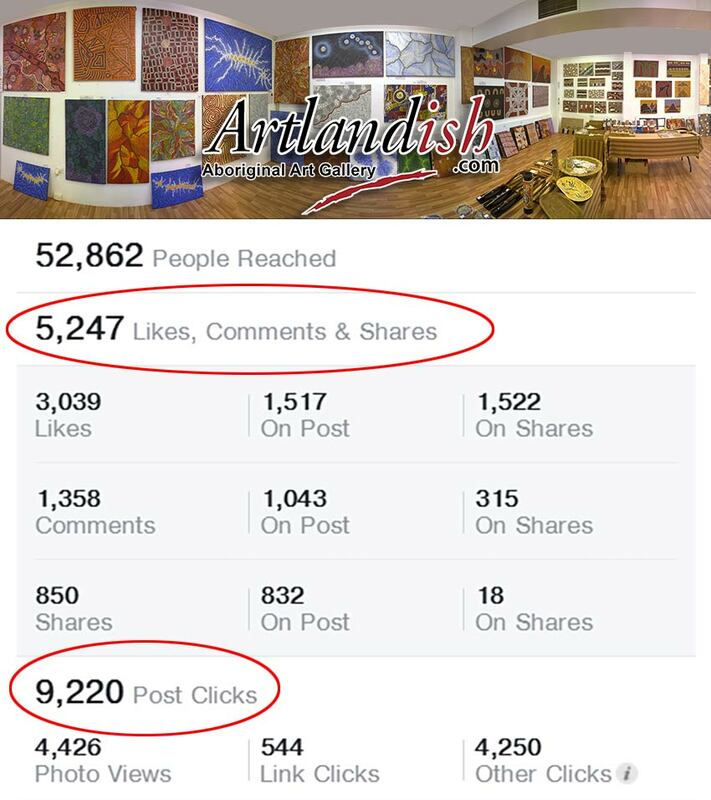 Here are the stats for organic posts to the Artlandish fan page leading up to and including the contest launch post. The post stats leading up to the contest are consistently very good but they don’t come close to the incredible numbers of the contest launch post! The launch post has 5 to 10 times the engagement levels of the previous 7 posts to the page. 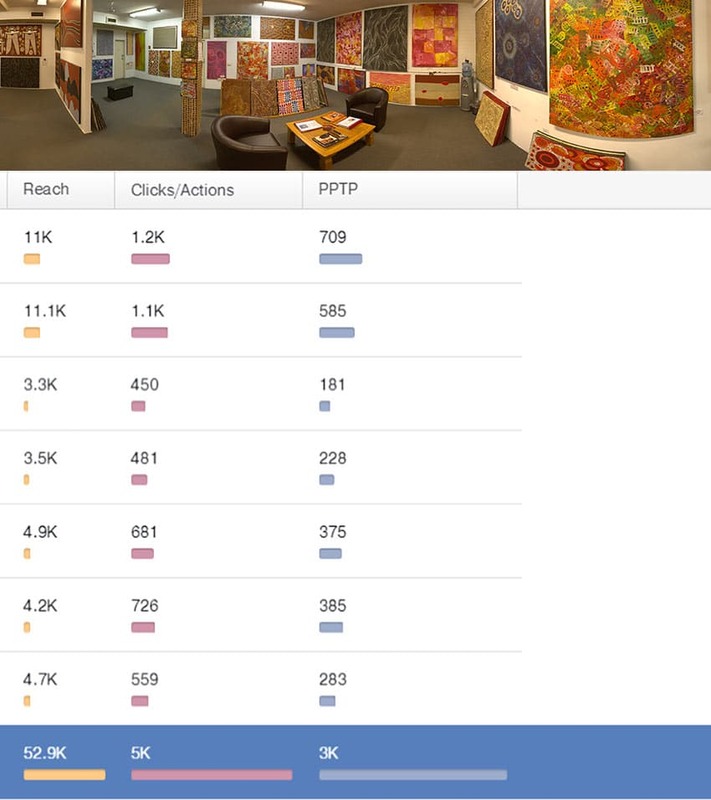 With the reduction in organic reach being a major issue for businesses with Facebook pages, these numbers defy logic. Most pages are happy if they can get their posts seen by 5-8% of their fan base. This post was seen by 5 times more people than the page has fans. Theoretically, all the fans of the page + another 40,000 people through likes, shares, comments and other discovery. Note: It’s against Facebook rules to require someone to “like” your page or “share” your post as a condition of entering a contest. You can only ask them to “like” that specific post or leave a “comment” on that specific post. Despite this, we have a huge number of “likes” and “shares” on the posts and the ads for this contest. This is because we developed a special technique and we use it to get amazing engagement and viral spread for the companies we represent. Where it says “cold traffic” it means the ads were targeted to people who didn’t know about the Artlandish Facebook page & hadn’t visited the website in the last 180 days & most likely never. Where it says “custom audience” it means the ads were targeted to people who had visited the Artlandish website sometime in the last 30-120 days. The column called “relevance score” indicates an ad rating from 1 to 10 on how relevant Facebook believe your ad is for the audience you are targeting. Many expert marketers are happy with a rating of 5-7. These ads were nearly perfect in the eyes of Facebook. Note: It’s against Facebook rules to require someone to “like” your page or “share” your post as a condition of entering a contest. This is because we developed a special technique and we use it to get amazing engagement and viral spread for the companies we represent whilst ensuring they remain compliant & don’t risk being banned from the platform..
What was so pleasing was we saw an influx of new people who previously had no awareness of us & limited understanding of the market but were now “hooked” on Aboriginal Art! WOW 1100 entries – This is a phenomenal response, will have to do the same for Mother’s Day. The results were incredible! We’d never seen such insane numbers and levels of engagement before. Best of all, we converted hundreds of entries into new customers! A small sample of Facebook contests we’ve run over the years! For a limited time Disruptive Cartel is offering businesses an opportunity to work together and create stunningly successful contests using our in-house Facebook Contest Funnel System we’ve perfected over 6 years! – A “Facebook Contest & Ads” package where we create a custom Facebook contest for you + research, create, set up, monitor and oversee a Facebook Ad campaign designed to get your contest maximum entries & builds you a database of email subscribers to market to in the future. 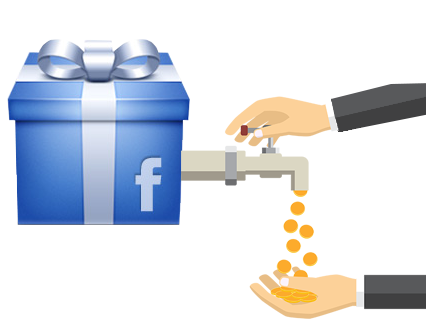 – A “Train You How To Create & Run Your Own Facebook Contest” package! We teach you or your staff personally everything you need to know and do to create and run the exact same types of contests that we have had huge success with. Some people prefer to do themselves and this package is perfect for those businesses who want to run their contests in house but want the latest techniques to ensure maximum success! – A “Premium Facebook Contest Funnel System” which includes everything in the previous “done for you” package plus a fully customised premium sales funnel designed to ensure you get maximum contest entries plus also generate new customers and increased profits immediately. This package ensures you don’t leave any money on the table and maximise the value of each and every entry you get. So no matter what level your business is at, no matter what the available resources you have at your disposal, there is a package that will suit your business and allow you the opportunity to start generating new customers and increased profits immediately! Right now you can get your preferred Contest Funnel Package at a significantly reduced price! We can only offer these prices for the first 12 orders. Beyond that we most likely will have too many clients on board to make this discount rate viable on an ongoing basis. We don’t outsource overseas, all work is done by our local crew so once we exhaust our workload and 12 order commitment the price has to go up! So if you want to expose your business to tens of thousands of new people, build your email database faster than ever before and generate a bunch of new customers and increased profits, lock it in now! Get Started Today & Be Generating New Customers Within A Week! Use it to cover the costs of family holiday? Take care of some private school fees? Pay for that new “toy” you’ve wanted? Buy your partner something really special or whatever it is you’d like to do! Take a look at the 3 options below and decide what package is going to fit you and your business best and click the corresponding button to start putting the Disruptive Cartel crew to work for you and never run an unprofitable promotion again! Most businesses on Facebook who have run a contest didn’t get any tangible results from it. It either failed flat out or it appeared to be going well but no sales ever eventuate. We’ve been doing contests on Facebook for 6 years, amongst other things and we’ve developed a very successful contest funnel system that turns contests into customers and prizes into pure profits fast! We’ve generated for clients over 25,300 Entries, 58,000 New Fans, 2,900 New Customers, 24,000 email subscribers & $300,000+ Revenue, across multiple niches & Just 8 Contests! For a limited time we are offering 3 packages at well below the industry average. But we can only guarantee the prices for the first 12 orders. The bottom line is when done correctly there is no faster way to ramp up the sales of an online business creating revenue, interest and buzz. We don’t outsource overseas, all work is done by our crew so once it’s full the price goes up! We know how to create very successful and profitable contests and can help your business generate new customers, prospects and profits fast!